Where has Phytophthora ramorum been found? Can the plants in my yard get Sudden Oak Death? How can I confirm that my oak tree has Sudden Oak Death? What conditions might be mistaken as Sudden Oak Death? Is Phytophthora ramorum toxic or contagious to humans or animals? If my oak tree has Sudden Oak Death, what are the chances it will die? Does glyphosate (Roundup and other trade names) enhance Phytophthora ramorum (the sudden oak death pathogen) infection? Who do I call if I think I need a diagnostic sample taken of my plant? My tanoak tree died from Sudden Oak Death. Before I chop it down, is there anything I need to know? Who are Master Gardeners? Can they help me with questions about Sudden Oak Death? How do I join the Task Force? Does it cost anything? Can anyone be a member of the Task Force? Sudden Oak Death is a forest disease caused by the plant pathogen Phytophthora ramorum. When the pathogen infects susceptible trees – such as tanoak, coast live oak, Shreve’s oak, California black oak, and canyon live oak – the name Sudden Oak Death is appropriate. These trees are infected through the trunk of the tree (except for tanoak, which can also be infected through the leaves) and are known as bole hosts. On many other plants in the forest – such as Douglas-fir, coast redwood, madrone, and many others – infections occur primarily on leaves and twigs and are referred to as Ramorum blight, which is generally non-lethal. 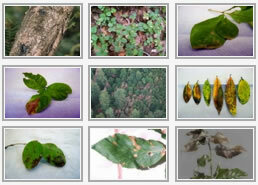 Follow these links for more information: hosts, symptoms, and forest disease. Phytophthora ramorum is a plant pathogen that causes Sudden Oak Death (SOD) as well as a foliar/twig disease (Ramorum blight) in other susceptible plants. While it is not uncommon for plants that contract Sudden Oak Death to succumb to disease, it is uncommon for foliar/twig host plants to die from infection. Foliar hosts, unlike bole hosts, are not a dead end for the pathogen. Many foliar hosts act as a breeding ground for the disease, allowing inoculum to build up on leaves, and then spread to new areas via natural or artificial means. Follow these links for more information: hosts, symptoms, and pathogen spread. Natural areas found with infection have been along the northern and central coast of California, as well as one county in southwest Oregon. To date, all of the natural areas found with infection are cool, moist, and frequently foggy. Forests with disease are made up of a mixture of host and associated host plants, and often have either tanoak or California bay laurel trees present. In addition to natural infection in woodland and forested areas, Phytophthora ramorum has also been found in the nursery system on host and associated plants. It is because of these detections that the nursery industry is undergoing extensive surveying for the pathogen in high-risk areas as well as falling under heavy regulation. Nurseries in a naturally infested area, or that have been found with previous pathogen infestations, must have a compliance agreement in place before being allowed to ship host and associated plant material. Additionally, any California nursery that has host and associated plants and ships interstate was placed on hold 4/22/04, and had to be inspected and found free from Phytophthora ramorum before shipping could resume. For more information on the federal Phytophthora ramorum nursery regulations and information on California’s regulations, see our Regulations and Nursery Information pages. For the most up-to-date list of known susceptible plants, go to the full USDA-APHIS list of current host & associated plants. Because this is a relatively new disease, the host list continues to grow as further research is conducted. To stay abreast of the current host list, periodically review the list of host plants. Additionally, while you may have plants that are found on the host and associated list, it is important to determine if you are in an area that is currently infested and conducive to pathogen activity, as this will assist you in determining the level of risk to your plants. Depending on other risk indicators, to a lesser or greater degree, it is also important to become familiar with disease symptoms. The only way to be certain that a plant has Phytophthora ramorum is to have a tissue sample laboratory-tested. This is necessary because other organisms and injuries can produce similar symptoms. However, there are some steps that can help you determine if Sudden Oak Death is likely. First, determine if your oak tree is a susceptible species by checking the full USDA-APHIS list of current host & associated plants. Second, compare the symptoms of Sudden Oak Death with those on your oak tree. Symptoms are described in the Diagnostic Guide. Third, check other susceptible tree and shrub species nearby. Do they have symptoms of P. ramorum infection? Finally, determine if you are in an infested area. Check maps available on the SODMAP website, contact the local UC Cooperative Extension office, your county Agricultural Commissioner, or CA Department of Forestry and Fire Protection office. If you are outside of an infested area, your tree could still have Sudden Oak Death, but it would be less likely. Follow these links for more information: hosts, symptoms, and contacts. Wetwood – a bacterial infection that is the result of an injury to the tree. Like Sudden Oak Death, wetwood also causes bleeding in the trunks and large branches of oak trees. However, Phytophthora ramorum bleeding is sticky and spotty, whereas wetwood bleeding is watery, foul smelling, and usually very copious. Annulohypoxylon thouarsianum – a fungus that looks like dark brown or black balls and grows on dead wood. Annulohypoxylon thouarsianum is often associated with the later stages of Sudden Oak Death, but can appear on the trunks of trees or logs that are dead or dying from any number of causes. California oakworm – a caterpillar with green or yellow stripes and a round, tan head. Oakworms can cause heavy to complete defoliation of coast live oaks, making the tree look as though it is dead or dying. Tree twigs and buds are alive though, and caterpillars will likely be visible, as will accumulations of droppings, or frass, beneath the tree. Infested trees usually releaf in the spring; a tree is rarely defoliated two years in a row. Foliar host look-alike symptoms – Foliar hosts can be damaged by the sun or other fungi, causing symptoms similar to Phytophthora ramorum on leaves. Other hosts lose their leaves in the summer, or display browning foliage during drought conditions. These symptoms can make foliar hosts look as though they have Phytophthora ramorum, but only laboratory testing can ensure an accurate diagnosis. For more information, see the Symptoms page. There is no evidence to suggest that ingesting products (e.g. food, medicine, etc.) from host material that is infected with P. ramorum, such as nuts, fruits, leaves, or berries poses a health risk to humans or animals. Related discussion on this topic can be found in Beverly Ortiz’s article: Contemporary California Indian Uses for Food of Species Affected by Phytophthora ramorum. There is no way to determine if an individual tree will live or die after contracting Sudden Oak Death. Each tree responds differently to infection, and experience tells us that it is rare for a pathogen to kill all plants it infects. Depending on a number of factors, some trees may never become infected, some may become infected and survive for various lengths of time, and others may become infected and die quickly. Because Sudden Oak Death is a relatively new disease in California, it will take time to determine just how likely these different outcomes are for different species of trees. Initial observations tell us that once infected, tanoak has a high probability of being killed by Sudden Oak Death, but some are still likely to survive. Live oaks (including Shreve oak) appear to have a lower probability of being killed by Sudden Oak Death, though many live oaks have been killed by the disease. There is little mortality information on black oak at this time, so it is difficult to predict how this tree species will fare. Sudden Oak Death appears to kill trees by girdling the main stem or trunk. Therefore, the number and severity of cankers on the trunk is considered an indication of how serious the infection is and whether it is likely the tree will die. A green tree may already be dead if cankers completely encircle the stem. Bark and ambrosia beetles will attack trees that are stressed, dying, or recently dead, regardless of whether the trees have Sudden Oak Death. The presence of fine dust in bark crevices, ranging in color from off-white to reddish brown, is a sign of beetle attack. Fruiting bodies of the fungus Hypoxylon occur on portions of the stem that are already dead. If the fruiting bodies or dust completely encircle the lower stem of the tree, chances are good the tree is dead, even if its foliage appears relatively healthy. It takes time for the foliage of a dead tree to dry out and turn brown. Hence, a dead tree could have green leaves and still look alive for a period of time. For more information, see the Symptoms and Best Management Practices pages. There is no research or other observational evidence to indicate that glyphosate application increases Phytophthora ramorum infection. In mixed-evergreen and redwood forests some land managers use glyphosate to control invasive weeds, such as French broom, poison oak and other problematic weeds. In coastal CA, these forest types contain coast live oak, bay laurel, tanoak and other plants susceptible to Phytophthora ramorum but the disease is not known to spread or intensify due to glyphosate treatment. Precautions. Always follow pesticide label instructions and consider non-pesticide alternatives to control pests. Pesticides can be injurious to humans, domestic animals, desirable plants, fish and other wildlife – if they are not handled or applied properly. Use all pesticides selectively and carefully. Follow recommended practices for the disposal of surplus pesticides and pesticide containers. Find your local county agricultural commissioner on the Contacts page of this website. Call the contact listed and explain the plant’s symptoms, as well as where it is located, to help determine if a sample should be taken. When cutting down a tree that has died from Sudden Oak Death, it is important to know that the structural integrity of the tree may not be sound. P. ramorum-infected trees often have limbs that break off or fail due to the tree rotting from the inside out. For this reason, it is advisable to hire a professional to cut down a tree that has died from P. ramorum. Additionally, be sure to clean all tools used to handle the infested material, so that the pathogen is not accidentally spread to other plants. When removing a P. ramorum-infested plant, it is best to leave the material on-site if possible, using large pieces of wood for firewood and chipping the small material. Firewood should be stored in a dry location and away from healthy trees. Under any circumstances, do not move the infested material to an uninfested area. If material must be moved off-site, contact your local agricultural commissioner for guidance on how to comply with P. ramorum state and federal quarantines. Quarantine information can be found on the Regulations page of this website. Master Gardeners are a group of UC Cooperative Extension (UCCE)-trained volunteers. They assist the UCCE in community outreach through gardening programs and horticultural activities designed to educate the public. Most Master Gardeners can assist with general Sudden Oak Death questions. They can also provide you with information and referrals on appropriate tree care and land maintenance. The names of Master Gardeners in your area can be found through your county’s Cooperative Extension Office (see Contacts). Joining the California Oak Mortality Task Force (COMTF) is as simple as coming to meetings, and membership is free. Sign up for the monthly newsletter to find out about upcoming events as well as the latest P. ramorum and Sudden Oak Death issues. Find out more on the About COMTF page. Anyone interested in cooperatively working toward limiting the spread of P. ramorum and maintaining the health of California’s forests can join the COMTF. Find out more on the About COMTF page. To get on the COMTF mailing list, send an email request to COMTF.SOD@gmail.com. You will then be added to our list and receive any COMTF mailings.